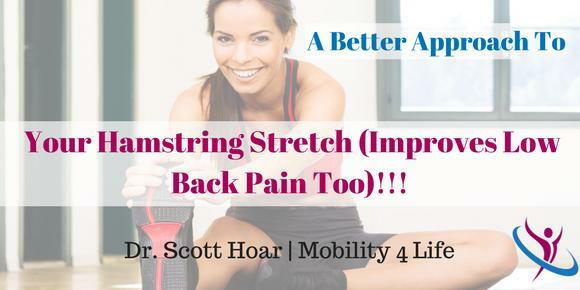 A Better Approach To Your Hamstring Stretch (Improves Low Back Pain Too)!!! A patient walked into my chiropractic office in Boynton Beach with the complaint of lower back and pelvic pain. He is a very active male in his late 30's that is an avid yoga and CrossFit enthusiast. During my assessment I had him bend over and touch his toes. He easily placed his palms on the ground and stated, "Yeah, I'm really flexible because of all my yoga." However, I noticed that when he bent over his hamstrings didn't lengthen all that much, rather his pelvis tilted WAY too much. Translation? He actually had tight hamstrings and an overly flexible low back and pelvis--perfect conditions for low back pain that radiates down the back of the leg. So among the other recommendations, I made to help him achieve pain relief, I recommended he start performing stiff-legged or Romanian deadlifts during his workouts. Keep a minimal bend in the knee throughout. Shift the hips backward and keep a straight, neutral spine throughout (it may be helpful to watch yourself in the mirror to make sure it's straight like the picture above). Descend until you feel a comfortable stretch in the top of your hamstrings, then return to the upright position. You probably will not touch the ground, that's okay. Start with a light-weight, maybe 40 to 50 lbs at first. These can be performed with a barbell like in this picture or with common dumbbells. They should be a regular part of your life (performed at least on a weekly basis). Perform multiple sets of at least 10 repetitions. The obvious difference between the Romanian and classic or regular dead-lift is keeping the legs nearly straight rather than bending at the knee. Keeping the spine straight is key and regularly performing this exercise correctly will protect your low back from pain and injury while at the same time strengthening it and lengthening the hamstrings.